On Friday I took a train an hour away from where I live to Higashi Matsuyama as I wanted to see some WWII caves and tunnels which I found out about recently on a couple of excellent sites that can be seen here and here. It was a lovely day and I didn’t really have a great idea of their whereabouts but sometimes you’ve just gotta go for it and hope that you get lucky. I knew they were a 30 minute walk away from the station and so I thought best to head in the direction of greenery and rocks in the distance. 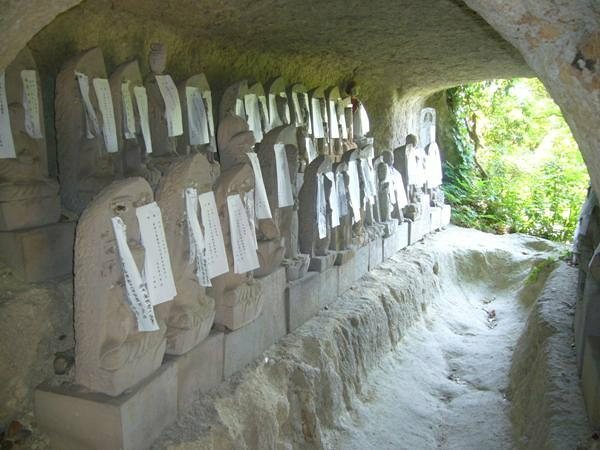 After about 25 minutes walking down a main street I saw a sign for the Hyakuana cliff tombs which was what I wanted. After taking a right turn I came across the abandoned ruins of the Gan Kutsu cliff face hotel as featured on Michael John Grist’s website. 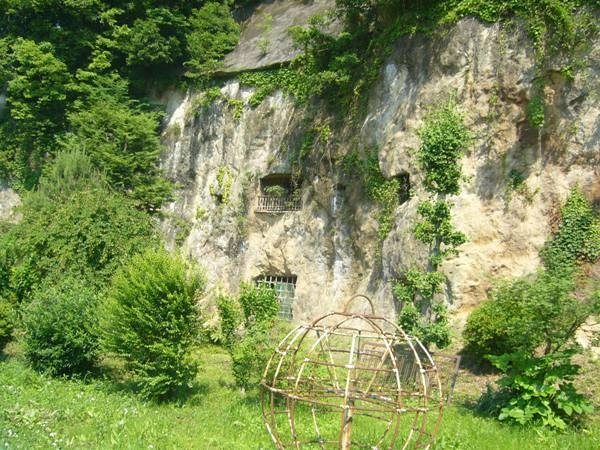 I can certainly understand the excitement of infiltrating these closed-off areas but I had no intention of doing anything like that at this site which was carved out as a cave hotel by one man and his chisel between 1904 and 1925 when he sadly died before it was opened. 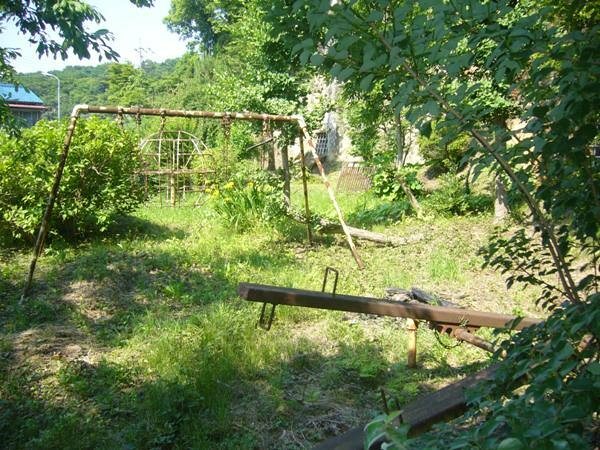 According to the aforementioned website it did open after his death but eventually closed due to cave-ins and obviously fell in to the disrepair that can now be seen today through the iron bars which surround the place. Just a stones throw away from that was a tiny temple which I had all to myself and featured a fair few buddha statues. 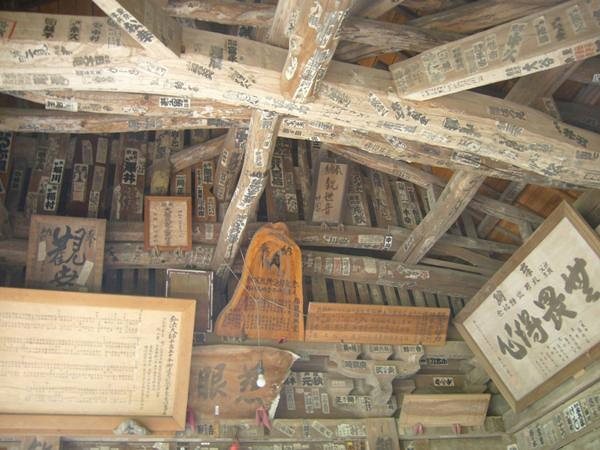 This had steps so I thought I might as well climb them and see what was up there – beams of carvings and writings in kanji. Beyond the temple was a mossy climb up a muddy waterfall/stream which was far steeper and more challenging than the picture maybe shows. I had no idea what was at the top but was looking for a bit of adventure. Not much really was the answer apart from a stone moument marking the location of the remains of Matsuyama Castle which was built in 1399 and destroyed 200 years later. Descending was a bit more tricky than going up but once I’d got down to ground level I ended up seeing quite a lot of the Yoshimi countryside as I took an hour return journey in the wrong direction which was exactly what this guy did on his journey and even though I read his account beforehand I still made the same mistake! I did get to see a shrine though with steps going on forever which would be good for doing some Rocky-like training on them. Luckily time was on my side and just round the corner from the former hotel and temple which I originally visited was my destination that can be read in the next part; Yoshimi Hyakuana WWII Cliff Tombs. 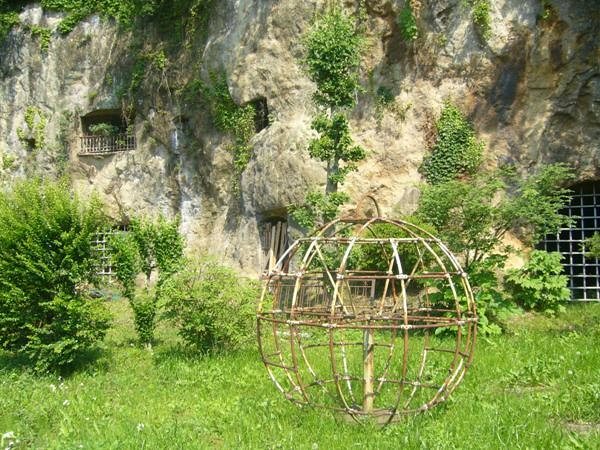 This entry was posted in Japan Life, Japan Travel, Tokyo Daytripper: and tagged cliff face hotel, Gan Kutsu cliff face hotel, haikyo day trip, higashi matsuyama, how to get to hyakuana, tobu tojo line, Tokyo Daytripper:, yoshimi hyakuana. Bookmark the permalink.